Tag Archive | "varsity boys basketball"
Brad Brechting led the team in total points scored with 22 against Comstock Park. Photo by Kelly Alvesteffer. On Monday, January 20, 2014, the Cedar Springs Red Hawks varsity boys basketball team took on the Panthers of Comstock Park. Before this match-up both teams were undefeated and ranked in Western Michigan. It was a very close game between the two undefeated teams. There was a total of 11 lead changes throughout the game, but in the end, Comstock Park came out on top and beat Cedar Springs 73-69 in overtime. “I felt we played at a high energy level from the start. The game was back and forth for a while and every possession required that level of energy,” said head Coach Jeff Patin. In the first period, it was a tight race the whole time, but Comstock Park ended up leading the Red Hawks 14 to 12. The Red Hawks came back fighting hard after the first period and entered into halftime down 5 points. After halftime, the Red Hawks came back out focused and in the third period, the Hawks scored 19 more points to add on to the score. Comstock Park was still on top after they scored 21 points, making it 50-43 at the end of the third period. The Red Hawks were not willing to give up and at the end of the fourth quarter the Hawks scored a total of 20 points while Comstock Park scored 13. At the end of the fourth quarter, the game was tied 63-63, sending it into overtime. The teams fought hard and the game went back and forth. In the end, Comstock Park scored 10 more points to clinch the victory, while Cedar Springs scored 6. The final score was 73-69 Panthers. “Comstock Park is a very good team. When you play a team of that caliber every possession is important,” stated Coach Patin. Cedar Springs’ own Brad Brechting led the team in total points scoring 22. He was 9 for 13 on his two point shots and 4 for 6 on his free throw shots. Cameron Link also came on strong totaling 15 points. Link was 3 for 8 on his 2-point shots and 6 for 9 on his free throws. David Kearney, Aaron Mabie and Nick Krajewski also contributed to the Red Hawks points by scoring some key baskets in the middle of the game. Kearney had a total of 12, and Mabie and Krajewski both came in with 6. Overall, Cedar Springs was 22 for 56 on their shooting. Their shooting percentage for the game ended at 39.3 percent. Comstock Park’s Jake Bush and Matt Hurley both scored a total of 20 points for the Panthers. Drake Baar came in third in highest scoring for Comstock Park with 14 points. The Panthers beat the Red Hawks in their shooting percentage coming in at 42.9 percent. The battle between the Panthers and Red Hawks was a hard fought match. The game ended was tied 8 times and the largest lead throughout the whole game was 10 points. After the loss, the Red Hawks record is now 8-1. “We didn’t finish the game the way we would like to, so we are hoping to learn from that experience,” commented Coach Patin. On Friday, January 24, the Red Hawks were scheduled to play the West Catholic Falcons. Due to the weather, the game was cancelled and rescheduled to Monday, January 27. Due to weather, the game was also cancelled again. It is now rescheduled to Saturday, February 1. The boys varsity game will be starting around 4:30 pm after the girl’s game. 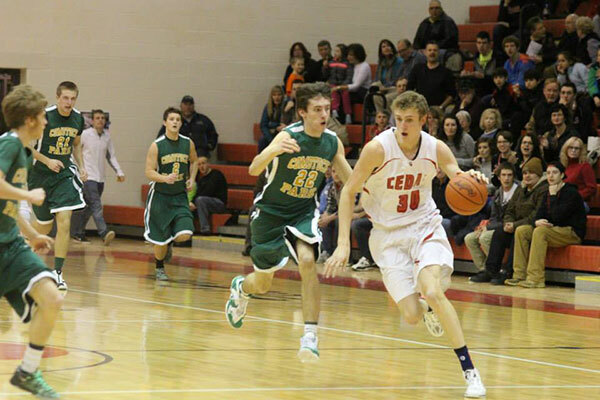 The varsity boys basketball team’s next game is scheduled for Friday, January 31 at Cedar Springs High School. The Red Hawks are matched up against the Wildcats of Northview High School. The Red Hawks are looking for their 9th win. So come on out and support the boys varsity basketball team! Tip-off is at 7:30 pm! Go Red Hawks! For the second time this season, the varsity boys basketball team dropped a heartbreaker in overtime to the Comstock Park Panthers. The Red Hawks used a strong defensive effort in the first quarter to jump out to a 9-5 lead. The defensive battle continued throughout the 2nd quarter, and Cedar Springs took a 19-15 edge into halftime. Great defense by both teams led to Cedar Springs shooting just 35 percent in the first half and the Panthers only 22 percent. A key steal and a basket by Comstock Park late in the 3rd quarter trimmed the Red Hawk lead to six and gave the Panthers momentum heading into the fourth. The lead went back and fourth throughout the 4th quarter. With 8 seconds remaining, the Panthers missed a free throw and Cedar Springs appeared to be fouled in the act of shooting. However, the official ruled that the foul occurred prior to the act of shooting and no free throws were awarded. Ryan Dines’ desperation 3-point was off the mark and the game went to overtime, which the Panthers dominated en route to a 50-44 overtime win. Brandon Slater played a key role throughout the contest, coming off the bench to score 10 points and grab 3 rebounds in one of his best games as a Red Hawk. Ryan Dines led the team in scoring with 14 points. Dines and Jason Gingrich also combined to play solid defense on Comstock Park junior guard Ryan Schall, the leading scorer in the OK Blue. Their defense led to Schall shooting 2/19 and only mustering 10 points. The Panthers converted on 25/32 from the free throw line while the Red Hawks shot just 5/12. The varsity boys basketball team has been on a hot streak that has turned their season around. At one point, the Red Hawks were 3-6 overall and 1-2 in the conference. What happened next was back-to-back OK Blue road wins at Belding and West Catholic (a game where Cedar trailed 17-2), and a home win over Tri County. The Red Hawks then turned their attention to their rival from Sparta. The Spartans were ranked as high as #8 in Class “B” by some polls, were in first place in the OK Blue, and had defeated Cedar Springs by 24 points in their first meeting. Behind great team defense and Trey Reed’s two free throws with 4.6 seconds left in overtime, Cedar Springs prevailed, 33-31. “That win was one of the most satisfying wins in my 14 years in this program,” noted Coach Secor. “I knew what it meant to our guys and how hard they have worked to play in and win a game like that. Throw in that it was against that team down the road and for first place, that just made it even better.” The win moved the varsity record to 7-6, and 4-2 in the OK Blue. The win forced a three-way tie at the time between Cedar Springs, Comstock Park, and Sparta. Last Thursday, the Red Hawks traveled to Comstock Park to play the three-time defending league champions. Cedar Springs trailed by two at the half, but controlled much of the second half, leading by as much as six points with under a minute to go. However, a deep 3-pointer by Ryan Schall tied the game with 12 seconds left and the Panthers scored 15 points in overtime on their way to a 53-46 win. 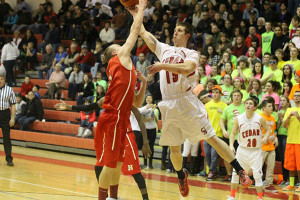 Cedar Springs was led by Jason Gingrich’s 15 points, and Trey Reed’s 13 points and 6 rebounds. Ryan Dines led the Red Hawks with 4 assists and great defense on Schall. Cedar Springs is now tied for 2nd place in the OK Blue at 7-7 overall and 4-3 in conference. The Red Hawks travel on the road this week for their final two road games at Coopersville and Forest Hills Northern. Red Hawk Seniors (L to R) Andrew Klompstra, Kyle Chaney, Jake Holtrop, Tyler Hinton, Alec Hanmer, and Tyler Baker. #1 Tyler Baker. “Tyler is a three sport athlete here at Cedar Springs. He is a team first guy that cares more about winning more than any individual accomplishments. A tough kid, a hard worker who always gets the most out of his ability”. For the Senior night game, the Red Hawks started 5 Seniors (all except the injured Klompstra). Tyler Baker got the Red Hawks going with a lay up on a pass from Alec Hanmer for a 2-0 Cedar lead. After a couple of Unity baskets, Jake Holtrop tied the game at 4 with a driving lay up. Two Hank Porter field goals kept Cedar close and Unity had a 12-8 lead after one quarter. In a low scoring 2nd quarter, Cedar got 2 buckets by Ryan Dines and one from Trey Reed and the score was 21-15 in favor of the Crusaders at the half. Hank Porter came out red hot in the 3rd quarter hitting 4 consecutive 3 pointers to give the Red Hawks a 27-26 lead with a minute to go in the quarter. Unity came back to take a 29-28 lead heading in to the 4th. Two Derek Ash lay ups kept Cedar within 3 points with 4 minutes left. After a Crusader basket, Cedar failed to score and Unity went in to the delay game. The Crusaders sank six straight free throws down the stretch and defeated the Red Hawks 43-32. Porter led Cedar Springs with a game high 16 points. Derek Ash and Ryan Dines had 4 each. Jake Holtrop, Tyler Baker, Alec Hanmer and Trey Reed had two points each, while Jason Gingrich led Cedar with 5 assists. Cedar Springs ends the regular season with an 8-12 record. Their 6-6 OK Blue Conference record was good for a third place finish in the league.